Come check out the First Annual North West Tarot Sympoium. www.NWTarotSymposium.com. I will be one of the many presenters at this exciting event being held March 6th-8th 2015 in Portland, OR at the Monarch Hotel. 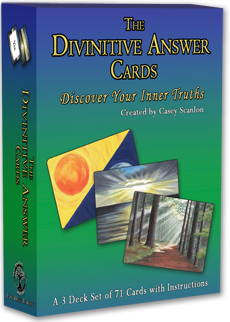 I will be demonstrating the many ways to make the Divinitive Answer Cards work for you. You can purchase my decks and many others, as well as artwork at this event. Registration is http://nwtarotsymposium.com/registration/ I am really looking forward to it. The Divinitive Answer Cards are a unique Self Help tool designed to help you make conscious, heart centered choices! Check them out. The Cards act as a mediator between your head and your heart when they are grappling with a tough decision. I recently had a comment from a confused user of the cards asking me to explain the contradictory answers that can come up. I thought if he had this need others would. So I am sharing my explanation here on the blog. The first thing to say is, Don’t make the mistake of thinking that what the cards say is your answer. The words on the cards aren’t your answer. How you respond to the words is. The contradictory nature of some of the answers is the very thing that shows you your true answer, what you really want or what you believe is best. If you ask a question that you are unconsciously hoping for a yes to, and you see No, you will have a twinge of disappointment, (showing you right there if you paid attention, that you want that Yes). Then you see the 15% and your inner voice will try to apply that 15% to the NO….it is a weak no, which means mostly YES, so you see what you want….. BUT if you really wanted the answer to be yes, and you knew deep down that NO was the best answer for your highest good, then that would be drawn out because your higher self will give that NO some consideration. The “Full speed ahead” could make you happy because it is what your ego wants, but it won’t feel right to your higher self, and it will apply the 15% to that Answer Card if it knows that’s not best. …so accept full speed ahead cautiously….at 15% velocity…it can mean what you make it. Then there’s always the possibility that you wanted the answer to be NO and you drew a NO. You would recognize that right away as feeling right, the 15% would make sense to you as only a 15 percent chance of it happening etc. The answer card would then be discounted as superfluous if it is totally contradictory. It says in the instructions to feel free to draw an additional answer card if you need more clarification. When the answer seems contradictory or superfluous it sometimes helps. There are really only 3 possibilities with the answers you draw. 1) You will recognize your answer as feeling right for you, (sometimes even if you don’t like it). 2) You will not resonate with it at all and it seems totally wrong, ( so that shows you your true answer, if you see what you don’t want, you can more easily see what you do want). One of the things the cards can do is that they can help you become to clear just exactly what the question IS. You can approach your question from a bunch of different angles. This is why it’s good to play with close friends too, because they can help you formulate your question and interpret the combination of cards. Sometimes their “take on it” will lead you in the right direction, sometimes they are off base, and when they are you know it. When you see the wrong interpretation, you have a better finger on the right one. Just like the cards. But just like advice from friends, you don’t have to do what the cards say. You are not meant to take their words as your answer. Their words are meant to lead you to your right answer by your reaction to them. It’s like a mini psych session. Psychologists are known for saying “how does that make you feel?” That’s how these cards work, you see an answer and ask yourself how does that make me feel? But with the Cards there is that whole other level where you start to try to manipulate the answer to be align with how you feel. The variety of answers is just there to help you gain clarity in many different situations. Some don’t work with every situation, but most often we find a way to interpret it’s meaning in the context of the question. It is that % card that shows the most room for manipulation. You can apply it to either the Yes/No card or the Answer Card, and which card you apply it to shows you what you want. The Divinitive Answer Cards look easy and really are quite simple, but explaining them is very complex sometimes, mostly because there is so much variety involved. There’s over 2,700 different answers that can come up to apply to an unknowable number of questions. And the interpretation depends on the personality and background of the questioner at that moment in their lives! 2 people can get the same exact answer and interpret it in very different ways! Hello. I am back after another day of being Thankful for all of the blessings and friends and loved ones in my life. This day just happened to be set aside for it, and included stuffing my face…I ate mostly desserts, including of course my own handmade CHOCOLATE. I am here his time to tell you about some things that came up during the “Author Event” that Mystic Earth in Roseburg, OR held on Sat. Nov. 17th. I would have come sooner, but chocolate making had to take precedence. It was a fun little time at Mystic Earth. Not a lot of people showed up perhaps because it was a rainy, dreary day of the type best spent inside someplace cozy and warm. But still I explained the cards to those who were there and guided folks through the use of them. It is always good for me to see the types of questions people ask, because I can learn more myself about how to teach people about them. One thing came up that I haven’t explained yet in my conversations and writings about the cards. That is, when you ask the cards a question about another person, what they feel or what they want or will do, you can’t get that answer. Only they will know for sure. You can only come up with how you would feel if they felt or wanted or did what you asked. For example: If you ask, “Does John want to ask me out on a date.” If you really want him to, (which you probably do if you are even asking the question) and you drew a NO you will be bummed, which tells you right there that you hope he does in case you haven’t figured that out inside. You should try to keep your questions about yourself. Ask the cards the type of questions you would ask if you were asking someone for advice. Think of the cards as your private adviser, ask the question, then as you interpret the meaning of the cards you are actually being your own adviser. In the example above, you would be better to ask, “Is it in my best interests to go out with John if he ever asks me out?”….or, “Should I try to encourage John to ask me out?”…or “Is it in my best interest to ask John out Friday night?” There are lots of ways to get to the main issue here, John Yes or No. Deep down you already know. The cards can show you. This is all, of course if you are playing with serious intent. If you are playing just for fun, go ahead and ask any question you want. But be prepared to just laugh at the answer and treat it like a game. It won’t be a serious answer if it wasn’t a serous question. But it will usually be funny. One of the young men there told me he asked the cards if they were lying and they said yes. In all of this it is still important to remember the true answer isn’t in what the cards say, it is in how you feel about what they say. If he believed they were lying and that felt right, then he would be comforted when he got an answer he didn’t like. Which brings me to another thing that came up. I asked a woman there if she had played with the cards and she said “Yes, and they are mean.” I thought that was interesting and we talked about it a little. They can feel mean when you don’t get an answer you want, and you believe the words on the cards to be your answer. The words on the cards are not your answer, unless they feel right and you recognize them. When I designed the cards I was sure to have negative answers in there because we don’t always get what we think we want. Sometimes we need to hear NO. Sometimes seeing the negative answers makes us all the more positive they are wrong, showing us what we knew in our hearts all along. The cards will slowly train you how to ask your questions to get to the crux of the matter. If you don’t get the answer you want with one phrasing, you can think of another way to approach the question. Which brings me to the final, and most remarkable happening of the event. I had 2 young men who work closely with the earth and plant life asking a question that was big in their lives. They each asked it in different ways. We were trying to circle around the issue and ask it from every angle. They drew the answers they expected and recognized and they were able to make good sense of their answer. The remarkable thing was they drew the answer card that says “Look To Nature For an Example” 5 times! I checked. that card was NOT bent or marked or different in any noticeable way. They shuffled and mixed the deck between turns. One kept the decks all mixed as one and just pulled one of each design, the other separated the designs and pulled from each pile. That card was important enough for them to see that it kept coming up. Each time it came up we thought would be the last because what are the odds. But that card came up 5 times out of 7 questions! Often, each time you play the cards there will be some new and funny or intriguing thing come up. ! Thanks for reading! This is my first experience with Blogging. I’ll be coming here, checking in, sharing my thoughts about and experiences with my Divinitive Answer Cards. Hopefully my blogging will answer any questions you may have about the decks and inspire an interest in experimenting with them yourselves! The Divinitive Answer Cards can be used solo, as a couple or in a group. When the cards are used with more than one person the session is often more fun because of the interaction and suggestions your partners make. Others can help you to format your question to be more specific. They may think of some way to approach or consider your issue that you haven’t thought of. They can help you interpret your answer or just remind you, that YOU know best what is right for you when their interpretations seem way off the mark! If you are using the cards solo you can make your session serious or just for fun,…and often the serious use is still fun, especially when you get the answer you were hoping for! But, I want you to know, you can always come here to my blog and ask me questions about your answer if you feel you need help in understanding it better. Often you can gain more clarity just by re-phrasing your question and asking it in a different way..or just drawing an additional Answer Card.